Can someone please help me write this blog?!? I am finding it difficult to come up with words to describe what Usain Bolt has done at the World Athletics Championships in Berlin, Germany! Excuse me if I use simple words like "wow", "amazing", "incredible", and "fantastic"! It's been that kind of run for the man from Jamaica in the German capital. There are no words that can accurately describe Usain Bolt's achievements in Berlin. The pictures, whether moving or still, tell the story of the might of Bolt. Did you see how the far ahead of the chasing pack he was at the end of the 200 meters final? You could have driven a truck through the chasm! Another race, another gold medal, another world record. Is this getting old for you? It's not me for! Watching Bolt and you can't help but have a smile on your face. Whether it's his unorthodox pre-race primping to the camera, or his sheer athletic ability once the starter's gun sounds, or the post-race prancing around the track interacting with fans lucky enough to get front-row seats to history. Bolt is a very likeable champion. The crowd is something that excites Bolt as well. He's said that all he wants to do is have fun. Here's betting he's having a blast right about now. I just conducted a phone interview with United States sprinter Shawn Crawford. He's the guy who finished fourth behind Bolt in Thursday's 200 meters final at the worlds. I asked him what he meant when he said that he felt like he was in a video game out there on the track. Crawford compared the race to playing a simulated athletics game on your home big screen television. You know, when the times are simply "stupid"! I think we all know what Crawford means. I also wanted to know whether, as a competitor, Crawford thought what Bolt is doing is good for athletics. He immediately said "yes". The American sprinter said that his Jamaican counterpart is bringing added attention to his sport. Just think, if a talent like Bolt wasn't in Berlin do you really think that we'd be talking as much about the World Athletics Championships like we have been? That's no slight to the hundreds of athletes who train day after day in their homelands to achieve personal or team glory. But, what Bolt has done has caught the attention and the imagination of millions around the world. Athletics, for so long, was in need of a star as bright as the 23-year-old to put the sport back onto the front burner. Usain Bolt is someone who constantly wears a smile on his face. He's brought smiles to those of us who can only marvel at his extraordinary talents on the track. Out of this world! nothing else can be said about this young man, i am from Panama as Alonso Edwards who came in scond place and we are very proud about what he did, we all knew Bolt was going to do something out of this universe so we were just expecting our guy to do a great race an so he did. Bolt is just great you can be sure we all wanted to see something great from Bolt altough we wanted Edwards to do good in the race. Prayer is the key. He has a whole nation praying for him! And the other Jamaicans. When Foster-Hylton won the 100m hurdles, her mother was at a church function and didn't even see the race. 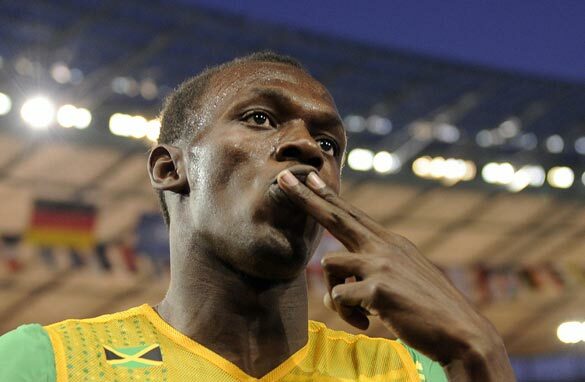 I am a Jamaican, and I too am finding it difficult to find superlatives to describe Bolt's performance. I am glad that in my lifetime, I can witness this global reaction to Bolt's superhuman performance in the sprints, and proud to claim him as one of our own. However, I am eagerly looking forward to the next generation of sprinters both here in Jamaica and elsewhere in the world, who are seriously motivated to do better than lightening Bolt. Youngsters here in Jamaica are already telling Bolt, that while they are proud and excited for him, they are going to become better than him. Bolt, a true and timely hero to the sports of athletics. The bolt from the blue that's become 'the Phenomenon on the tracks' that's what I would call him. Bolt has brought track and field back to 'life' after some rather difficult and drug- plagued years. Usain Bolt is taking athletics to the next and a higher level. Hats off to the the dazzling Jamaican sprinter. When I first saw him running in China my reaction was wow! I was equally baffled by the distance between him and the next runner. He is simply phenominal. Of course he has the muscle, the agility and the discipline. I always want to see his next race. Breaking records like pieces of glass-what a guy! Prayer? May be not. They all pray! !